ARLINGTON, VA, August 28, 2014 –PBS KIDS and Sesame Workshop today announced the launch of Cookie Monster’s Challenge for iPad, a new SESAME STREET app and the first app that the two children’s media organizations have created together. Designed for children ages 3-5, the app builds on SESAME STREET’s 45th anniversary season’s curricular focus: self-regulation and executive function skills that teachers identify as critical for school readiness. Cookie Monster’s Challenge offers a series of games designed to engage children and challenge them to practice self-control, focus, memory, following directions and problem-solving. The app launches just in time for the debut of SESAME STREET’s 45th season, which premieres September 15 on PBS KIDS (check local listings). Ten Mini-games – Games present exciting challenges designed to give children the opportunity to practice self-control, focus and memory. Nine Levels – With each level, the mini games become more challenging, keeping children engaged and motivated. One Crazy Cookie Making Contraption – As children complete levels, they earn pieces of a giant and hilarious cookie-making machine that they can use to decorate the cookies they’ve earned and deliver them to their hungry friend, Cookie Monster. Profiles – Children and parents can create up to three separate profiles so that everyone in the family can progress through the game at their own pace. Cookie Monster’s Challenge helps kids develop the school readiness skills that will be highlighted in SESAME STREET’s 45th anniversary season, which will include new installments of the wildly popular “Cookie’s Crumby Pictures,” a five-minute segment featuring Cookie Monster that helps children learn self-regulation skills and strategies. Other highlights for the new season include new letter and number of the day dance breaks; new original songs; new street stories; new “Elmo the Musical” and “Super Grover 2.0” segments; new animations; and, as always, new spoofs and celebrity appearances. A bonus half-hour SESAME STREET program that will air on weekday afternoons and weekend mornings, complementing the regular weekday one-hour series, also debuts on PBS KIDS in September. Additionally, Abby’s Sandbox Search, a new game that focuses on letters, letter sounds and alliteration, will launch on pbskids.org/sesame this fall. 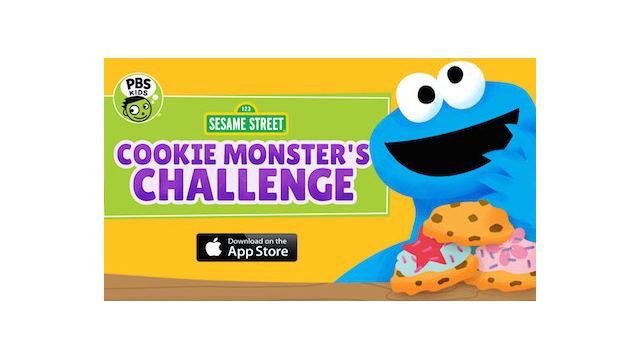 The new Cookie Monster’s Challenge App is part of PBS KIDS’ ongoing commitment to helping kids learn through educational media. The organization offers more than 30 apps to help build school readiness skills. More information on PBS KIDS apps is available at pbskids.org/apps. Cookie Monster’s Challenge is available for $2.99 from the App Store on iPad or at www.AppStore.com/PBSKIDS. Images of Cookie Monster’s Challenge can be found on PBS PressRoom. Sesame Workshop is the nonprofit educational organization behind SESAME STREET, which reaches 156 million children across more than 150 countries. The Workshop’s mission is to use the educational power of media to help children everywhere grow smarter, stronger and kinder. Delivered through a variety of platforms, including television programs, digital experiences, books and community engagement, its research-based programs are tailored to the needs of the communities and countries they serve. For more information, visit us at www.sesameworkshop.org. Sherlock, Season 3 on MASTERPIECE: The Game is Online!